Indian cotton farmers are committing suicide at alarming rates, one every 8 hours. The farmers are forced into con­stant debt by landlords, chemical and seed companies. 54% of all pesticides sprayed in India is put on cotton! We at ADYA INTERNATIONAL do not like this since it is not a sustainable system. Hence our organic cotton orders helps push the balance in a new direction. It feels great to see International busi­nesses /productions who support these farmers and thereby leading to a positive change affecting them directly and indi­rectly. Organic practices help safeguard the environment and protect habitats. Organic production conserves the nature and promotes diversity amongst different species. Organic agriculture safeguards the health of people and the planet, because it doesn't use toxic pesti­cides and insecticides. By using eco-friendly farming methods and renewable resources, organic farmers avoid putting chem­icals into the soil or polluting our air and water. 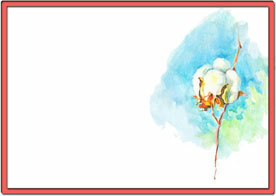 Contrary to popular belief, the "100% cotton" that is convention­ally grown is not pure cotton. Cotton occupies less than 3% of the world's farmland, but those crops account for over 25% of the insecti­cide and pesticide use in the farming industry! Organic cotton is grown without toxic chemicals; hence, organic growers use biological and cultural practices against pests.